Vintage black and white drawing of goldfish. Their fish tank is quite crowded but these golden carp are quite happy to live in colonies. They have been treasured pets of the Chinese for centuries but many around the world have enjoyed keeping their own goldfish. 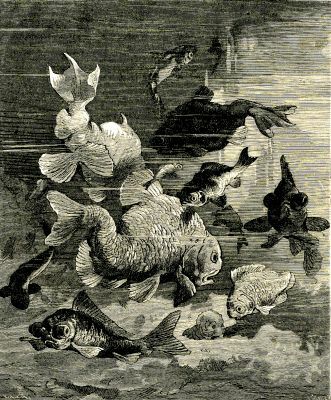 Black and white goldfish swim together in this public domain fish image. This vintage drawing was published in 1879 in the December 9th edition of Harper’s Young People.